Think faster. Focus harder. Stay sharper. What makes Hunter Focus the smart choice? Focus uses the perfect ingredients in the perfect doses. Rival products offer just 60-90 capsules in each bottle - but Hunter Focus holds 120. Why? Because we never compromise or cut costs, quality is our focus. Hunter Focus isn’t just a pre-made nootropic - it forms half of the Ultimate Cognition System. Most nootropic brands lack the science to back up their claims. By contrast, Hunter Focus uses nine of the best-researched nootropics on the planet. It’s also free from artificial colors, preservatives, flavors, gluten, GMO and soy. When people order nootropics, they often buy from suspect online sources in Asia or the Far East. But for your safety and peace of mind, Hunter Focus uses only the finest nootropics. And we prepare each one to strict FDA and cGMP guidelines in the USA and UK. Other brands roll out a huge range of weak nootropics and swap quality for quantity. 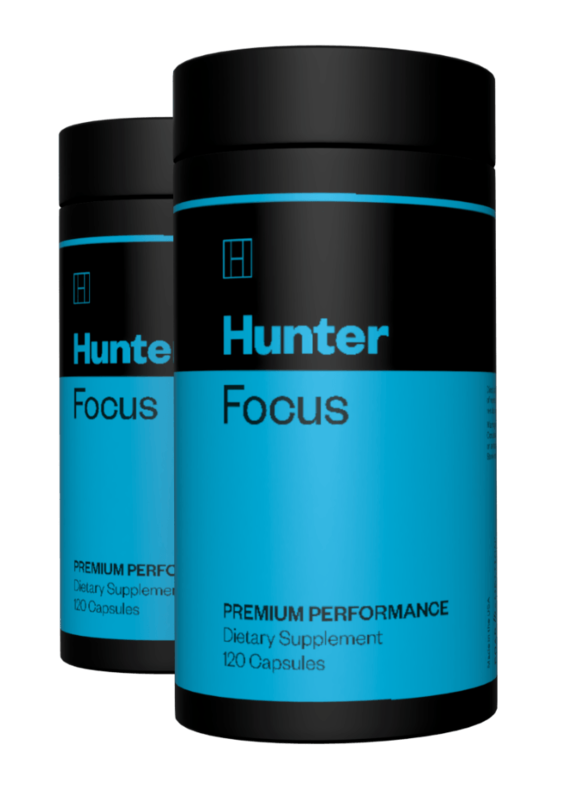 But Hunter Focus is our only nootropic – and one of just three premium products in the Hunter range. This allows us to focus on every last detail and ensure you get nothing less than the best. Passion flower contains flavonoids that raise GABA levels to reduce stress and help you sleep better . It also promotes the release of dopamine to lift your mood and sharpen your focus . 1. Elsas, S.M. et al. Passiflora incarnata L. (Passionflower) extracts elicit GABA currents in hippocampal neurons in vitro, and show anxiogenic and anticonvulsant effects in vivo, varying with extraction method. Phytomedicine. Author manuscript; available in PMC 2011 Oct 1. 2. Toda, K. et al. Passionflower Extract Induces High-amplitude Rhythms without Phase Shifts in the Expression of Several Circadian Clock Genes in Vitro and in Vivo. Int J Biomed Sci. 2017 Jun; 13(2): 84–92. Bacopa contains bacosides A and B. These two active ingredients improve your body's response to both chronic and acute stress . The compounds also cross the blood-brain barrier to improve the strength of the signal between neurons. This leads to better mood balance, faster processing and slower brain aging . As a result, bacopa helps you absorb more and learn faster. It also ensures you can better recall those names, dates and stats that once refused to emerge from the tip of your tongue . 1. Sheikh, N. et al. Effect of Bacopa monniera on stress induced changes in plasma corticosterone and brain monoamines in rats. J Ethnopharmacol. 2007 May 22;111(3):671-6. Epub 2007 Jan 30. 2. Calabrese, C. et al. Effects of a Standardized Bacopa monnieri Extract on Cognitive Performance, Anxiety, and Depression in the Elderly: A Randomized, Double-Blind, Placebo-Controlled Trial. J Altern Complement Med. 2008 Jul; 14(6): 707–713. 3. Roodenrys, S. et al. Chronic effects of Brahmi (Bacopa monnieri) on human memory. Neuropsychopharmacology. 2002 Aug;27(2):279-81. N-acetyl-L-tyrosine (NALT) is an amino acid that your brain uses to produce dopamine, epinephrine and norepinephrine . These key neurotransmitters promote brain health and enhance your memory, focus and problem-solving skills . NALT even improves your power to multitask. As a busy guy, you may have to work long hours. But even when the whole world stops around you, NALT helps you fight the symptoms of fatigue to ensure you hit every deadline with ease . 1. Purves, D. et al. Neuroscience. 2nd edition. 2. Shurtleff, D. et al. Tyrosine reverses a cold-induced working memory deficit in humans. Pharmacol Biochem Behav. 1994 Apr;47(4):935-41. 3. Neri, D.F. et al. The effects of tyrosine on cognitive performance during extended wakefulness. Aviat Space Environ Med. 1995 Apr;66(4):313-9. L-theanine helps you feel both calmer and more alert . It does this by raising the levels of GABA, serotonin and dopamine in your brain to lift both your mood and energy levels. The amino acid also boosts brain alpha waves , which have the power to unlock your imagination. This makes L-theanine ideal for those times when you need to find new and creative answers to nagging problems. 1. Higashiyama, A. et al. Effects of l-theanine on attention and reaction time response. Journal of Functional Foods. Volume 3, Issue 3, July 2011, Pages 171-178. 2. Nobre, A.C. et al. L-theanine, a natural constituent in tea, and its effect on mental state. Asia Pac J Clin Nutr. 2008;17 Suppl 1:167-8. Decades of research shows phosphatidylserine (PS) helps renew and repair neurons . As a result, your memory becomes sharper, and you feel happier and more alert . PS works by boosting glucose metabolism (the fuel for your mind). It also promotes healthy levels of nerve growth factor (NGF) in the brain . As one of the best-tested nootropic ingredients in the world, PS's anti-stress effects are even shown to improve golf performance . This makes it perfect for when you need to prove your mettle to new colleagues or clients. 1. Kim, H.Y. et al. Phosphatidylserine in the Brain: Metabolism and Function. Prog Lipid Res. Author manuscript; available in PMC 2015 Oct 1. 2. Parker, A.G. et al. The effects of IQPLUS Focus on cognitive function, mood and endocrine response before and following acute exercise. J Int Soc Sports Nutr. 2011 Oct 21;8:16. 3. Naftelberg, S. et al. Phosphatidylserine Ameliorates Neurodegenerative Symptoms and Enhances Axonal Transport in a Mouse Model of Familial Dysautonomia. Published: December 20, 2016. 4. Jäger, R. et al. The effect of phosphatidylserine on golf performance. J Int Soc Sports Nutr. 2007; 4: 23. The results of an eight-week study show maritime pine bark extract promotes sustained focus . The same study also shows it can hone your planning and decision-making skills. And it achieves all this by increasing blood flow to send more glucose and oxygen around the brain . To give you the best results, the pine bark extract in Hunter Focus is standardized with 95% proanthocyanidins. This makes it the strongest and most potent form of pine bark around. 2. Nishioka, K. et al. Pycnogenol, French maritime pine bark extract, augments endothelium-dependent vasodilation in humans. Hypertens Res. 2007 Sep;30(9):775-80. Lion's mane mushroom contains hericenones and erinacines. Much like fertilizer for your brain, these compounds help your brain produce more nerve growth factor (NGF)  to protect and repair your nerves. The result? You stay sharper for longer. Lion's mane also promotes brain plasticity  to improve your memory and expand your scope for learning. Lion's mane mushroom even reduces stress  to keep you happy and calm under pressure. 3. Nagano, M. et al. Reduction of depression and anxiety by 4 weeks Hericium erinaceus intake. Biomed Res. 2010 Aug;31(4):231-7. In-depth research shows ashwagandha repairs and renews the axons and dendrites in your brain to restore and enhance your memory . Ashwagandha also boosts the level of choline in your brain. This lifts your mood , boosts motivation  and allows you to recall even the smallest details with ease . Research shows 300mg of ashwagandha reduces cortisol (stress hormone) levels by up to 27.9% after 60 days of use . In one study, this led to a 68.1% reduction in ‘social dysfunction’ – a broad term which covers stress and shyness. 1. Tomoharu, K. et al. Neuritic regeneration and synaptic reconstruction induced by withanolide A. Br J Pharmacol. 2005 Apr; 144(7): 961–971. Published online 2005 Feb 14. 2. Bswajit, A. et al. A Standardized Withania Somnifera Extract Significantly Reduces Stress-Related Parameters in Chronically Stressed Humans: A Double-Blind, Randomized, Placebo-Controlled Study. 3. Cooley, K. et al. Naturopathic care for anxiety: a randomized controlled trial ISRCTN78958974. PLoS One. 2009 Aug 31;4(8):e6628. 5. Chandrasekhar, K. et al. (2012). A prospective, randomized double-blind, placebo-controlled study of safety and efficacy of a high-concentration full-spectrum extract of Ashwagandha root in reducing stress and anxiety in adults. Indian Journal of Psychological Medicine, 34(3), p.255. When ingested, citicoline splits into choline and cytidine. Your body then converts choline into acetylcholine, which improves the signal strength between neurons. This enhances memory, attention, learning and skills of recall . The body also converts cytidine into uridine. By doing so, it repairs and protects your brain cells to help you stay at the top of your game for years to come . In one study, citicoline improved membrane formation by 26% and brain energy by 13.6% . At a dose of 250mg, this translates to marked increases in attention and fewer mistakes in tests. 1. Taylor, P. and Brown, J.H. Synthesis, Storage and Release of Acetylcholine. Correspondence to Palmer Taylor and Joan Heller Brown, Department of Pharmacology, 0636, University of California, San Diego, La Jolla, California 92093. 2. Hasselmo, M.E. The Role of Acetylcholine in Learning and Memory. Curr Opin Neurobiol. Author manuscript; available in PMC 2009 Mar 24. 3. Grieb, P. Neuroprotective Properties of Citicoline: Facts, Doubts and Unresolved Issues. CNS Drugs. 2014; 28(3): 185–193. Published online 2014 Feb 7. 4. Bettini, R. and Gorini, M. [Reaction times during citicoline treatment]. Clin Ter. 2002 Jul-Aug;153(4):247-50. Other Ingredients: Rice flour, Gelatin (capsule), Silicon Dioxide, Vegetable Stearate. 1. Altman, I. (2015). Successful Habits of Millionaire Business Leaders. [online] Forbes. Available at: https://www.forbes.com/sites/ianaltman/2015/10/14/successful-habits-of-millionaire-business-leaders/#6cf920a82b10 [Accessed 29 Oct. 2018]. 3. The Irish Times. (2008). Cat's claw - a thorny issue of a lack of research in humans. [online] Available at: https://www.irishtimes.com/news/health/cat-s-claw-a-thorny-issue-of-a-lack-of-research-in-humans-1.943561 [Accessed 30 Oct. 2018].